Unit(s) Responsible: Camarillo Special Enforcement Detail / Camarillo Patrol Services. A suspected narcotic addict was arrested for possessing numerous firearms and ammunition during a criminal threats investigation. In December of 2018, Camarillo Police patrol deputies responded to a call for service within the City of Camarillo regarding criminal threats. During the course of the initial investigation, Camarillo Patrol deputies learned the victim reported to have been threatened by a known suspect, later identified as Agoura Hills resident Ali Namin. Detectives assigned to the Camarillo Special Enforcement Detail began investigating this crime. In addition to the alleged threats, detectives learned Namin had numerous types of handguns and rifles registered to him. Detectives also learned that Namin had a history of illegal drug related arrests in both Ventura and Santa Barbara counties. Namin had been arrested in Ventura County in November and December of 2018 for drug related charges, including 11550(a) HS / Under the influence of a controlled substance and 11350 (a) HS / Possession of a controlled substance. These cases are still pending in Ventura County Superior Court. 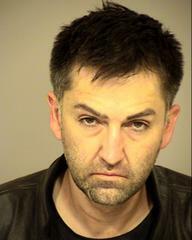 On 01/11/19, Camarillo Special Enforcement Detail detectives located Namin while he was seated inside his vehicle at a location within Los Angeles County. During a search of Namin’s vehicle, detectives located about 12 grams of methamphetamine and 4 grams heroin. Drug paraphernalia located inside the vehicle indicated Namin had been smoking controlled substances. 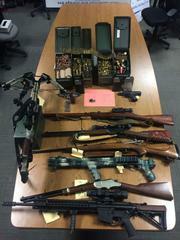 Detectives served a search warrant at Namin’s residence in Agoura Hills and seized 12 firearms and over one thousand rounds of various types of ammunition. Almost all the firearms, including an AR-10 and a high powered WW2 vintage sniper rifle, were located unsecured on the floor in the residence. The interior of the residence was unsanitary and additional drug paraphernalia was located, again indicating Namin was actively using controlled substances. Based upon the results of the investigation and the items located during the service of the search warrant, detectives believe Namin is addicted to controlled substances and that he was in possession of firearms. Namin was arrested for violation of PC 29800(a)(1): Possession of a Firearm by Person Addicted to a Narcotic drug, PC 422: Criminal Threats, HS 11550(a): Under the Influence of a Controlled Substance, HS 11350(a): Possession of a Controlled Substance, and HS 1377(a): Possession of a Controlled Substance. He was booked into the Ventura County Pre-Trial Detention Facility with a bail set at $100,000.00.